Add Soya chunks to boiling water for 5 minutes. Then remove and drop it into the cold water. Squeeze out the water from Soya nuggets and tear it with your hands to small pieces. Grind grated Coconut, Fennel seeds and Coriander leaves with little water in a mixe. Heat 1 or 2 tspns of oil in a pan. Add Bay leaf, Cinnamon, Cloves, Mustard seeds and Urad dal one by one. Once it starts spluttering, add Curry leaves and Onion, fry till onion turns into golden brown. Add Ginger Garlic paste and fry till the raw smell goes. Add Soya nuggets and fry for 2 to 3 minutes. Then add Turmeric powder, Chili powder, Coriander powder and fry till the smell of masala goes. Add Tomato puree and fry till it becomes soft. Then add the ground ingredients(prepared in step 2), 1 or 2 cups water and Salt to it. 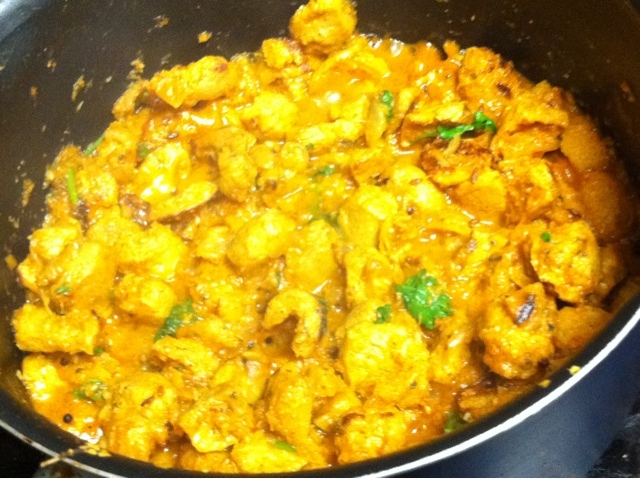 Cover and cook till the masala blended with the curry and it becomes thick. This may take 15 - 20 minutes. Garnish with cilantro and enjoy with rice or roti. I love to have it with biryani. this is sure a wonderful combo..looks great n delicious. mmmm... looks very tempting and yummy. 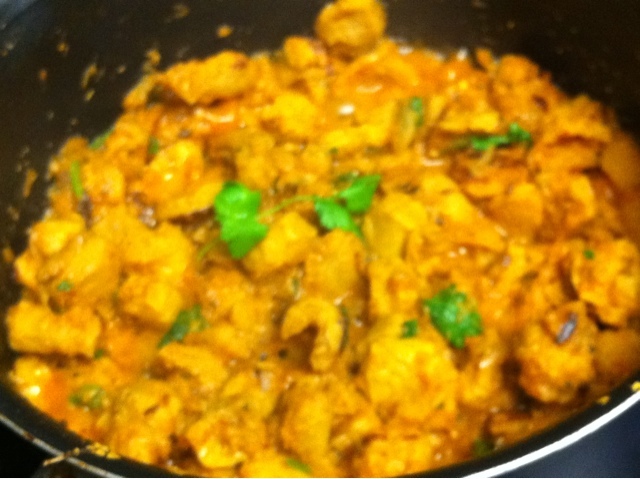 Lovely curry .. if interested do send it to my dish it out event.